I know I shouldn't be, but I am. Quantic Dream has been making big budget narrative games for years, but mostly for PlayStation. With the exception of the David Bowie-starring Nomad Soul and the gloriously absurd Fahrenheit, all of writer/director David Cage's games have been exclusive to Sony's consoles. 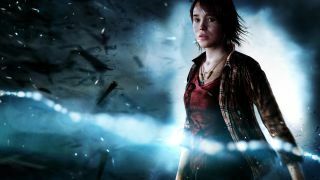 But not any more, because three Quantic Dream games—Heavy Rain, Beyond: Two Souls, and Detroit: Become Human—will soon be making their PC debut on the Epic Store. If you've never crossed paths with a Quantic Dream game before, you can expect the following: lavish production values, QTEs, wild tonal inconsistency, overwrought drama, gratuitous shower scenes, and SWAT teams. Seriously, the developer loves a SWAT team. You know that scene in The Office where Michael Scott is at an improv class and he can't think of anything clever to do, so he just keeps pulling out an imaginary gun and shouting freeze? It's basically that. Heavy Rain is a thriller about a serial killer who leaves origami figures as a calling card. Sounds cool, right? But it's spoiled by ham-fisted storytelling, erratic direction, and weird dialogue that no human would ever speak. What begins as an enjoyably pulpy mystery soon turns into a straight-to-video horror movie, with an embarrassing romantic subplot thrown in for good measure. But here's the thing: the story might be poor, but Heavy Rain is actually one of the most complex and reactive branching narrative games I've ever played. There are dozens of endings and paths through the story, and it's even possible for every main character to die. So in that respect, I actually kinda like it. It takes itself way too seriously and there are far too many tedious QTEs, but the sheer number of ways the story can play out is genuinely impressive. Beyond: Two Souls is the most indulgent of the three games. It stars Ellen Page as Jodie, a woman granted supernatural powers by an otherworldly entity she calls Aiden. Again, the premise is actually pretty interesting. You take control of Aiden, protecting Jodie from danger, and Page does her best with the script. The problem with Beyond is that it feels like David Cage is trying to make ten completely different films at once, resulting in a confusing jumble of themes and tone. It doesn't know whether it's a supernatural thriller, a coming-of-age teen melodrama, or an action movie. It leaps between time periods and genres so wildly, and for so little reason, that it's almost impossible to get invested in the story. And when Jodie visits a wise old Native American in the New Mexico desert, well… let's just say 'write what you know' is a piece of advice Cage should have taken to heart. There's a SWAT team too, of course, and a gratuitous shower scene. It's the self-seriousness of Quantic Dream games that makes them particularly maddening. Sometimes this kind of blinkered enthusiasm and self-belief is actually endearing, and can result in something magical—an Ed Wood movie or Tommy Wiseau's The Room. But in Cage's case it just comes across as pretentious. Fahrenheit is my favourite game of his, because it never takes itself that seriously—or at least doesn't seem like it does. Heavy Rain seems to be the moment when Quantic Dream started making overwrought, emotional games. But Fahrenheit has fun with its preposterous story, and remains one of my favourite adventure games as a result. For the most part it's just as wildly inconsistent and badly written as Beyond, but makes up for it by being joyously silly. I mean, what other game lets you have a Matrix-style fight with the internet? As for Detroit: Become Human, I haven't played it yet, but I'm actually looking forward to it coming to PC. From what I've read it falls into a lot of the same traps as other Quantic Dream games, but I still have a soft spot for the studio's particular brand of interactive storytelling. It's frustrating, really. It's clearly capable of creating brilliantly dynamic, non-linear interactive stories, but this is clouded somewhat by the poor writing. I've been pretty savage here, but I think it's great that these games are coming to PC. As riddled with flaws as they are, they're still undeniably unique experiences.